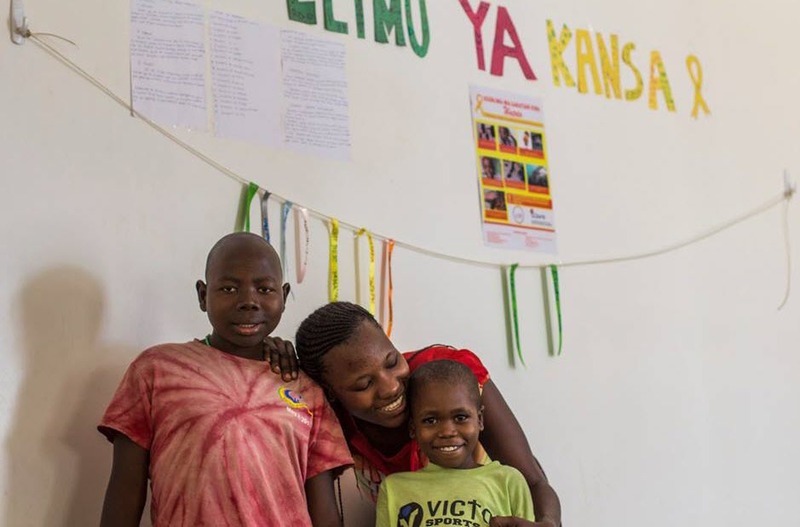 In 2014, Kristin Schroeder, then a global health fellow, was treating Japhet, an 11 year old boy, for lymphoma at the Bugando Medical Centre in Mwanza, Tanzania. Japhet’s family was deeply dedicated to pursuing a cure for his cancer, but the cost and logistics of the treatment were prohibitive. 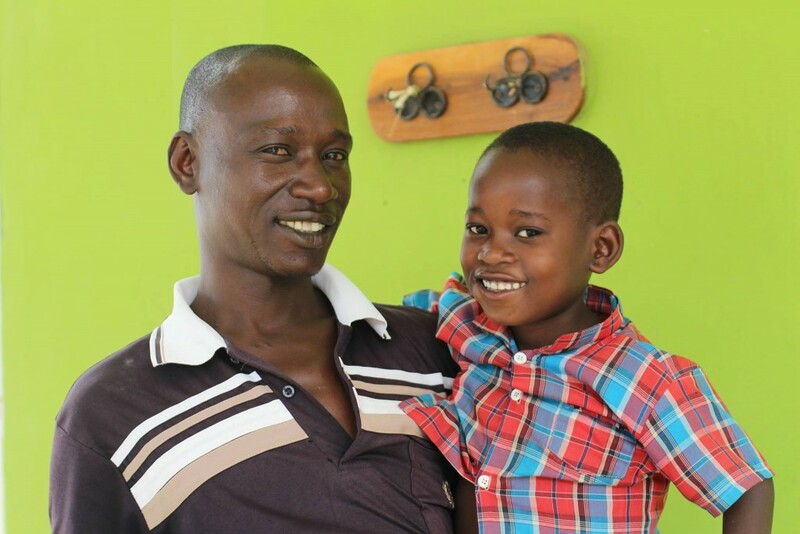 One day, Japhet’s father called Schroeder to tell her that he was now able to afford the treatment—he’d sold the family’s cow to save his son. “That conversation really hit home for me, because that cow was the family’s livelihood,” said Schroeder, now an assistant professor of pediatrics and global health at Duke. “Japhet’s parents did everything they could to get treatment for their son, but unfortunately, by the time they pulled the resources together, it was too late.” Japhet’s metastatic lymphoma took his life shortly after that conversation. Stories like this are a stark reminder of the barriers faced by cancer patients in many parts of the world. 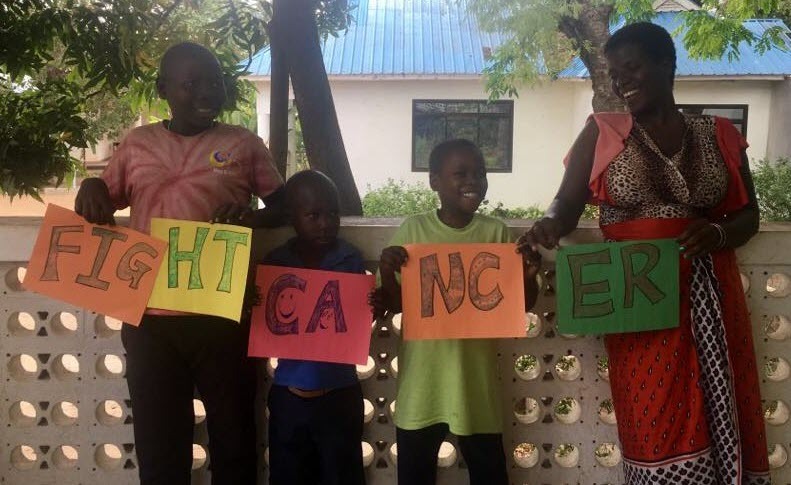 In Tanzania, pediatric cancer treatment costs around $300—a fraction of what it would cost in the United States, but an insurmountable burden for many in a country where most families make less than $500 per year. Even for those who can afford treatment, travel is another obstacle. 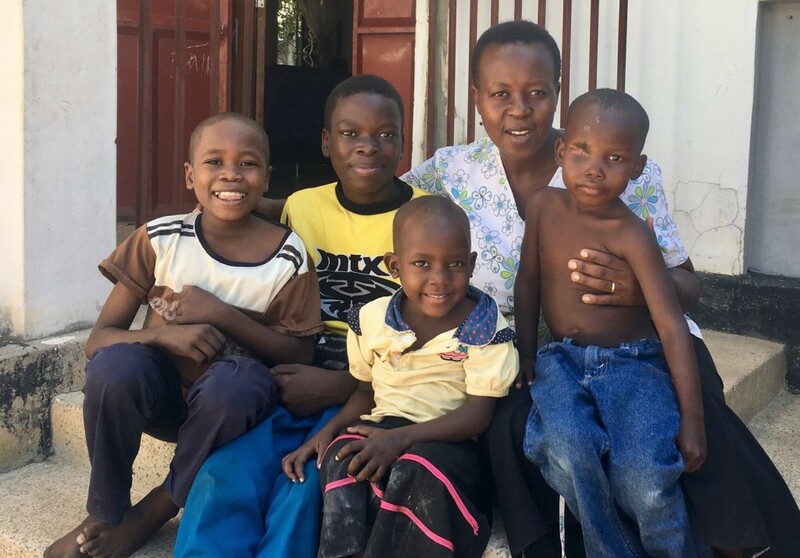 The Bugando Medical Centre (BMC) is one of only three hospitals in the country that provides oncology care, and most Tanzanians live at least six hours from a cancer treatment facility. Faced with such financial and logistical hurdles, some families are forced to abandon treatment mid-course. Others, like Japhet’s, aren’t able to marshal resources until the disease has progressed. As a result, while more than 80 percent of children in the United States now survive cancer, in Tanzania, only 20 percent do. But for Schroeder, who went to Tanzania with the goal of improving those outcomes, Japhet’s case was also a wake-up call. Soon after the encounter, she began working with Nelson Chao—professor of medicine, immunology, pathology and global health at Duke—to find ways to help families overcome the roadblocks to cancer treatment. Chao, the director of the Duke Global Health Institute’s global cancer initiative, had been working with Schroeder to establish a research infrastructure at BMC, but the two doctors realized that to improve the odds for families like Japhet’s, they needed to address issues outside the hospital as well. In late 2014, they established the International Cancer Care and Research Excellence Foundation (iCCARE), a nonprofit whose mission is to give any child diagnosed with cancer the same chance of a cure regardless of where they live. Funded primarily through individual donations, iCCARE covers treatment costs for BMC pediatric cancer patients and provides other resources and support, including a hostel where they and their families can stay while receiving treatment. Anit, an iCCARE patient, and her father: “We thought that when you get cancer, that’s just it—you’re dead,” her father said. “But the doctors gave me hope because they told me they were going to treat my child … What gives me heart is seeing Anit getting better to come to where she is now ... The fact that iCCARE is helping us brings a lot of encouragement to me.” Photo by Izzy Pinheiro. Part of that expanded vision has been to create new clinical positions that fill gaps revealed by Schroeder’s research. The new patient navigator’s primary role is to educate families about the cancer treatment process. She also consults with nurses and residents on other pediatric floors to identify possible cancer symptoms in children who were admitted to BMC for other reasons. Prior to hiring the patient navigator, the average time to cancer diagnosis among these patients was 49 days; now, it’s just over two weeks. This result is incredibly significant, Schroeder says, because “expedited diagnosis not only increases survival rate, but it also correlates with a reduction in treatment abandonment.” In part due to the success of the patient navigator program, the survival rate at BMC has increased from 19 percent to 39 percent, and the treatment abandonment rate has decreased from 47 percent to 32 percent. iCCARE has also hired a clinical coordinator, who oversees outpatient clinic visits, communicates with patients between visits, checks patients into the clinic and helps track patient outcomes. iCCARE’s hostel, meanwhile, provides much more than a free place to stay. Opened in 2017 in a building just a 10-minute walk from BMC, the hostel has room for eight patients and their parents, as well as a nurse, a social worker and a cook who provides two meals a day. And it’s become a community hub where patients and families find comfort through the challenges of treatment. Donatha, center, is the iCCARE nurse. “I’m here at the iCCARE hostel as a nurse to care for the children who are suffering from cancer. My job is to give medications, take vital signs, and care for the families staying here while they get treatment. We have many families from many places—from different backgrounds—all living here. I try and help the families create a sense of unity.” Photo by Izzy Pinheiro. Aloyce, second from right, is the iCCARE cook. “I work for iCCARE here at the hostel as a cook and support for the families. When they live in the village at home, it is very different, so we try and create an environment that supports them. When I finish work, I teach the children here to read and write. I try to get them moving so they are happy and they feel loved.” Photo by Izzy Pinheiro. Schroeder takes over the kitchen on Sunday evenings when she’s in Mwanza, where she’s based for six months of the year. 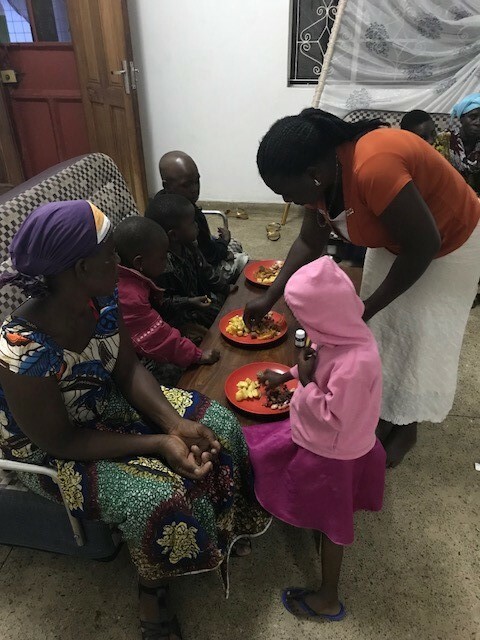 She says these dinners not only give her a chance to get to know the families, but they’ve also unexpectedly enhanced her research efforts and intervention strategies. 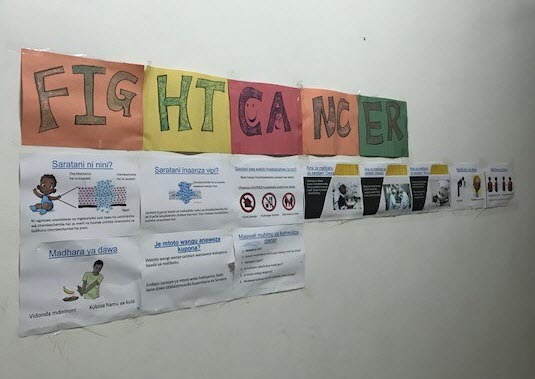 One of these approaches is the “Wall of Cancer Education”—a wall in the hostel with pictures of symptoms and descriptions of the disease. 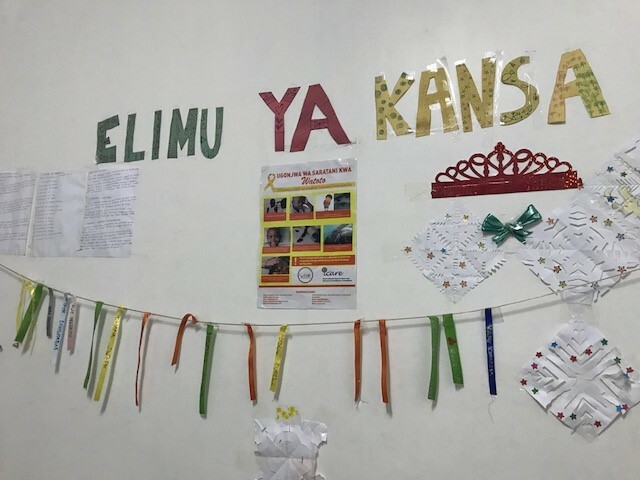 Many of the images were created by Tanzanians, one of whom felt a particular connection to iCCARE because she’d lost a child to leukemia. Dinner at the hostel. Photo by Kristin Schroeder. Wall of Cancer Education. Photo by Kristin Schroeder. Many of Schroeder’s patients and their families then put their newly-gained cancer knowledge to work in their communities, where lack of awareness about cancer—even among medical providers—often results in delays or prevents families from seeking treatment until it’s too late. Some former patient families have accompanied Schroeder at education sessions for local providers and talked to the doctors and nurses about their experiences. Others have taken informational brochures to distribute in their villages. “It’s been neat to see how much knowledge the families have after going through the treatment process, and they often want to go back to their communities and share this knowledge with others,” she said. Meanwhile, Schroeder and her colleagues from BMC are testing a pediatric cancer awareness campaign, including community talks, educational radio programming and posters, in several communities the Mwanza region. Once the campaign ends, they’ll conduct surveys to determine whether and to what extent the different approaches helped people learn about pediatric cancer. Although they’ve made extraordinary strides over the last few years, Schroeder, Chao and their Tanzanian colleagues are just getting started—and iCCARE is only part of the bigger picture. One of their broader goals in sustaining the steadily improving pediatric cancer outcomes is to help train a corps of local oncology providers. “We’re working with oncology colleagues in several countries to ensure that our work at Bugando isn’t just a one-time, one-place effort,” said Chao, whose work in Tanzania centers around setting up programs, cultivating partnerships and establishing a research infrastructure. Partnerships with the Tata Medical Center in Calcutta, India, and the Uganda Cancer Institute in Kampala, Uganda, are providing oncology fellowship opportunities for Tanzanian and other East African pediatric residents. And Schroeder has taken part in training oncology residents and nurses at BMC. They’re also working with oncology providers at the two other medical centers in Tanzania that offer pediatric cancer care to create a “Tanzanian Pediatric Oncology Team.” They plan to develop standardized protocols, increase efficiency of care and maximize resources across sites. It’s not easy to draw a line between where their Duke work ends and their iCCARE work begins. Ultimately, Schroeder says, they just want to provide more—and better—care to more people. Kristin Schroeder, second from right, with pediatric cancer patients and their caregivers at the Bugando Medical Centre inpatient ward. Photo by Sabina Mafwimbo. 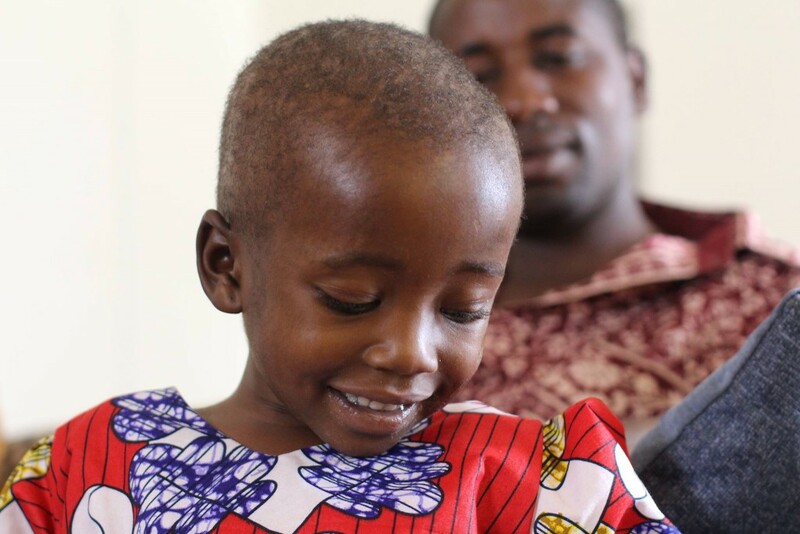 Our aims are to improve pediatric cancer outcomes in Tanzania and ensure that all children with cancer have the same chance of a cure ... and we’ll do what it takes to make our vision a reality.